Misery loves company, as the old saying goes. For Evertonians, the only set of supporters who really used to understand the pain we endured were those who followed Manchester City. For years, our Manc counterparts were fellow travellers. Like us, they had enjoyed their good times (albeit briefer than ours). And like us, if they had been alone in their city, then notions of success would be absolute, not relative. But fate had ensured that they were not alone. City had their own red menace on their doorstep. So, both sets of fans learned what it is like to live in the shadow of a rival club, one whose success was so complete for a time that it it made the achievements of neighbouring clubs pale by comparison. To the outside world, both variety of Blues were the junior partners in their respective cities, forced to live life playing second fiddle to (from our perspective) loathsome neighbours, who revelled smugly in their glory. Because of this, in the past, encounters between Everton and Manchester City never matched the mutual hatred and slavering media interest that characterised games that have taken place between Liverpool and United. It’s hard to manufacture a rivalry when both clubs and each set of fans have so much in common. Even the supposed antipathy that exists between the two cities (something I’ve never really bought into) failed to light a spark. We were comrades united, brothers in arms, allies in misery. But that connection is no more. Since the arrival of their bottomless backers, City have fled from what they once were with an escape velocity that verges on the shameless. From the netherworld of the third tier to the possibility of a historic treble, the Manchester City of today would be unrecognisable to those who used to stand on the Kippax. Look on the clubs as two people that were once locked in a loveless marriage, one characterised by frustration and the sense of lives not quite panning out as hoped. Although it seemed likely that they would stay together forever, comforted by a shared sense of disappointment and mutual dislike of people more successful, by some miraculous turn of events one has managed to get out, find somebody richer and now enjoys the kind of life that could only have dreamed of in the past. But should we be jealous of being left behind? Outsiders probably think so. Judging by the avalanche of slobbering adulation meted out to ‘Pep’ and his charges this season, access to such talent is widely regarded as the apogee of footballing desire. And certainly sitting there watching the turgid cack that Everton have served up this year and then comparing it to the free flowing football put together by City as they romp their way to the title, it would seem an easy question to answer. Who wouldn’t want to watch that and at the same time win titles, compete amongst the continent’s best and attract stellar talent from across the globe? There is a yawning chasm between an Allardyce side huffing and puffing its way through a game and a Guardiola outfit seamlessly outclassing opponents. It’s clear that City are on a path that has a single destination. The club’s owners will one day make sure that City rival the narrow band of super clubs that dominate world football. For them, doing alright is not enough. They will demand dominance domestically and an enduring presence on the European stage. And they will do whatever it takes to get there, which means outspending rivals, hoovering up young talent, recruiting the very best to run the club. And of course, that all sounds great. It screams of an organisation that wants nothing but total success. But that list of things that the club will do to achieve this is incomplete. Because you also have to include what it will do to its ‘customers’. And that’s what those who follow the club now are. They are customers to be milked at every possibility. And the bigger the club becomes, the more they can do this. The greater your reach domestically, the more corporate money that comes in, the increasing number of tourists visiting, empowers the owners to treat the working class fans, many of whom stood by the club during the lean years, with incremental amounts of contempt. Things like ever increasing hospitality sections, escalating ticket prices and the rising cost of shirts and kits are not unique to Man City. Our own club have been guilty of following such trends (although to a lesser degree). But you get the impression that for City, this is just the beginning. If the club reaches its desired destination then, in a similar way to other super clubs, it will gradually divorce itself from the community it was once indelibly tied to. If you can sell any ticket at any price, secure in the knowledge that there will always be enough tourists, corporate clients and wealthy fans to fill the seats, then why ever consider those who can no longer afford to go to the game? Football, at its very heart, is a game obsessed with upward progression. As fans we are conditioned to want our team to finish as high as possible. But we rarely stop to reflect on what this means. In football today, within an English context, to reach the top means moving as far as possible away from the old model, one characterised by working class fans, younger supporters and a club rooted in the local community. That’s the price you pay to get to the destination that City have in mind. In purely football terms, it’s hard not to be jealous of what City are like today. Right now there is not a team in Europe that they could not beat and the club looks poised to become the dominant force not just in Manchester but also in England and possibly Europe. For Evertonians starved not just of success but also of anything approaching ‘quality’ football, we can only dream of being in such a position. But, would I take what they have knowing where it will lead and what kind of club it would create? I’m not so sure. 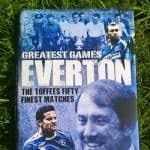 There has always been something magical about Everton, a football club that managed to stay in touch with the best while at the same time remaining rooted in what it has always been. While the club might have suffered a degree of ‘Premier League-itis’, it has also ensured that it is connected to both its fans and the local community. The difference between the Everton followed by fans a generation ago and the Everton of today is not that vast. And increasingly, that’s not something that the likes of City can say. There is a hope amongst Blues that the arrival of a new stadium, combined with a backer who appears willing to invest, means that the club is on its way to bigger and brighter things. But few of us imagine that this will take us to the same destination as City. Not that I mind. Like any fan imbued with a desire for upward progression, I want Everton to become competitive. But I also want them to remain ‘Everton’. City might have everything that we are supposed to desire in a football club but they will lose something magical on their journey to dominance, a price that I’m glad Everton won’t be paying too.